In This Corner of the World appears deceptively simple, but it tackles a well-worn subject of Japanese animation: the horror of World War II on the civilian population. It is very long, perhaps too long for some people, but it also ends up being a very moving film, one that offers if not clear forgiveness, at least peace. It is pre-war Japan, and naive dreamer Suzu Urano lives an idyllic life with her family. It isn't long, however, before she's married off to Shusaku Houjo, who met her briefly on a bridge in Hiroshima. Suzu, whose great passion is to paint and draw, lives her life quietly with her in-laws, doing her best to be useful even if she is a bit forgetful and absent-minded. However, as her time goes on the Empire of Japan continues its war, bringing difficulties as she adjusts to her life and marriage. Shusaku loves Suzu, but they still have yet to have a child. As far as she is concerned, she still harbors feelings for Mizuhara, a taciturn fellow from her village near Hiroshima whom she painted a picture for a school assignment. Despite whatever they may feel, she remains loyal to her husband. The war grows harder, with death raining down on them. Among those eventually killed are her niece, Harumi, when the little girl steps on a delayed-time bomb. Suzu was holding Harumi when it exploded, and that bomb not only took Harumi but also her dominant right hand. Suzu sinks into a depression, and thinks a visit to her family just outside Hiroshima for a festival might lift her spirits. Before leaving however, she and everyone in town observe a massive cloud burst over Hiroshima, with all communication from there suddenly cut off. With this and later Nagasaki, the voice of The Emperor is heard for the first time on radio, announcing that the war is over, and they have lost. Suzu finally goes to find only one sister still living. She also re-encounters Shusaku, who had been sent there for administrative duties. There, an orphan who has survived the blast wanders near them. Shocked, they take her back home, where the extended Houjo family is shocked to find the devastated child is full of lice. Quick to the bath for her. In the credits, we see the orphan growing up, with Suzu and Shusaku raising her as their own. In This Corner of the World is surprisingly free of bitterness or anger despite the subject matter. Instead, it reflects Suzu's personality: quiet, kind, a dreamer who sees the waves as rabbits in the ocean. She is an artist, with an artist's sensibilities. The film is very quiet, floating gently from scenes of her attempting to fit in to her new family and struggling to literally find her way home to one dealing with the horrors of war, even if she stands to admire the beauty of bombardment colors versus the danger she faces because of them. There are moments of sheer beauty in writer/director Sunao Katabuchi's adaptation of the manga of the same name. The melding of Suzu's painting of the sea to 'real life' is excellently rendered, and while not skipping on the horrors of war both from a distance (the dangers of shrapnel on Suzu and Harumi) and up close (the 'melting' of the orphan's mother is painful and terrifying). 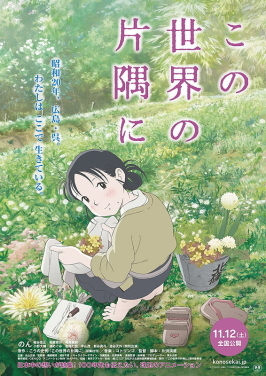 In This Corner of the World is as I've said, a subject well-worn in Japanese animated film, ranging from the heartbreaking Grave of the Fireflies to the more recent The Wind Rises. Unlike the former, which dealt with the Hiroshima bombing head-on, or the latter, which was more about how instruments of beauty can be reshaped to instruments of war, In This Corner of the World dealt with the civilian population. The Urano and Houjo families are impacted by war in all manner of ways, from having food rationed and getting sugar on the black market, to more unusual ways, like when military police confiscate some of Suzu's drawings, paranoid that she is a spy. This suggestion appears to terrify the Houjos, until the MP's leave and all but Suzu burst out laughing, astonished that anyone would imagine the absent-minded dreamer Suzu could be some sort of Japanese Mata Hari. I think though, that perhaps for some, In This Corner of the World floats too slowly, and its two-hour running time may feel a bit of a drain. Long anime films are par for the course, and while In This Corner of the World is beautiful both storywise and visually, the length may prove a bit taxing for the more casual viewer. However, in its tale of one family affected by war, with all its tragedy, and how they had to carry on, even managing to find life goes on with bombs and fire-bombings, In This Corner of the World won't fail to move the viewer.